He first learned his trade in Hawaii where he lived for 15 years. “The pipe market in Hawaii 10 to 15 years ago was very limited so I focused a lot on nonfunctional art glass for tourists visiting the island. Over the years, I have been refining my pendants and marbles, paying a lot of attention to detail,” Kimmo shares. After relocating to the mainland, he found community with fellow glassblowers in Eugene, Oregon – the epicenter of hand-blown glass and home to iconic glass pipe artist Bob Snodgrass. Kimmo’s unique art pieces, many adorned with colorful flowers and glimpses of distant galaxies, are created using implosion techniques – blowing out a bubble on a tube and then drawing on it. With his space marbles, he focuses on generating layers to create depth. “I spend a lot of time on my prep work to create fine detail, along with research in photography of outer space,” he says. 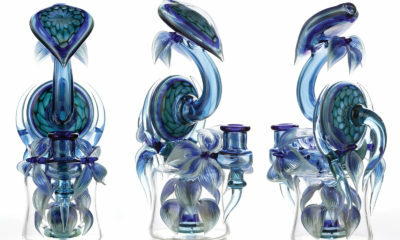 Gaining exposure and experience in glass pipe blowing at the last Champs Trade Show, Kimmo relates how the pressure to perform has shaped his current work.